When you add a modern page to a site, you add and customize web parts, which are the building blocks of your page. This article describes the Twitter web part. With the Twitter web part, you can show tweets that are relevant to you or your audience right on your page. If you don't see this web part in the web part toolbox, your administrator may have disabled it. Go to the page where you want to add the Twitter web part. Hover your mouse above or below an existing web part or under the title region, click , and then select the Twitter web part. You can show results from a collection of Tweets that you curate and manage. If you don't already have a collection, you can create one using TweetDeck For instructions, see advanced tweetdeck features and scroll down to the section on Collections. Once you have created your collection, click the Filter icon at the top of the collection to access the menu, then click Share and View on twitter.com. Under Display as, select List or Grid. Turn on or off Display header and Display borders. Set Theme color to Dark or Light. Enter the number of the maximum number of tweets you want to show in the Maximum Tweets displayed box. 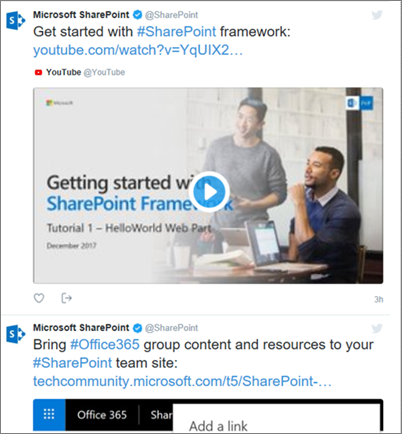 Note: Administrators familiar with SharePoint Online PowerShell can hide this web part from the web part toolbox by using the command Set-SPOTenant [-DisabledWebPartIds <Guid>]. See the PowerShell reference for Set-SPOTenant for more information.